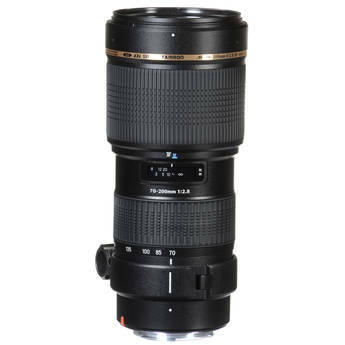 Buy New Tamron SP 70-200mm F2.8 Di LD Macro (NIKON) Malaysia At FotoZZoom! The Tamron 70-200mm f/2.8 Di LD (IF) Macro Lens is a telephoto zoom lens that has a large maximum aperture of f/2.8 which remains constant throughout the zoom range. It also offers an excellent "close-focusing-distance" minimum of just 3.1' (0.95 m) throughout its entire zoom range, with a maximum macro magnification ratio of 1:3.1 at f=200mm. When mounted on an APS-C sensor size digital SLR camera, it provides a focal length equivalent of 105-300mm. The Nikon version of this lens incorporates a motor built-in to the lens itself, which gives this lens the capability to autofocus with all Nikon DSLR cameras (including the D40 and D60 series). In addition, as a result, focusing will be quieter and more responsive. Di (Digitally Integrated Design) is a designation Tamron puts on lenses featuring optical systems designed to meet the performance characteristics of digital SLR cameras. Features like LD glass elements and Internal Focusing put this lens in the same category as the much bigger and more expensive professional Tamron lenses. Box Dimensions (LxWxH) 11.6 x 6.2 x 6.1"